A Gollum repository's contents are human-editable, unless the repository is bare. Pages are unique text files which may be organized into directories any way you choose. Other content can also be included, for example images, PDFs and headers/footers for your pages. May be written in a variety of markups. Can be edited with your favourite system editor or IDE (changes will be visible after committing) or with the built-in web interface. Can be displayed in all versions (commits). Gollum meets all these requirements, and as an added bonus, is extremely fast and lightweight. Since Gollum itself offers no user authentication, this design secures gollum behind an oauth2 proxy, so that in order to gain access to the Gollum UI at all, oauth2 authentication (to GitHub, GitLab, Google, etc) must have already occurred. Authenticate against your OAuth provider, and then start editing your wiki! 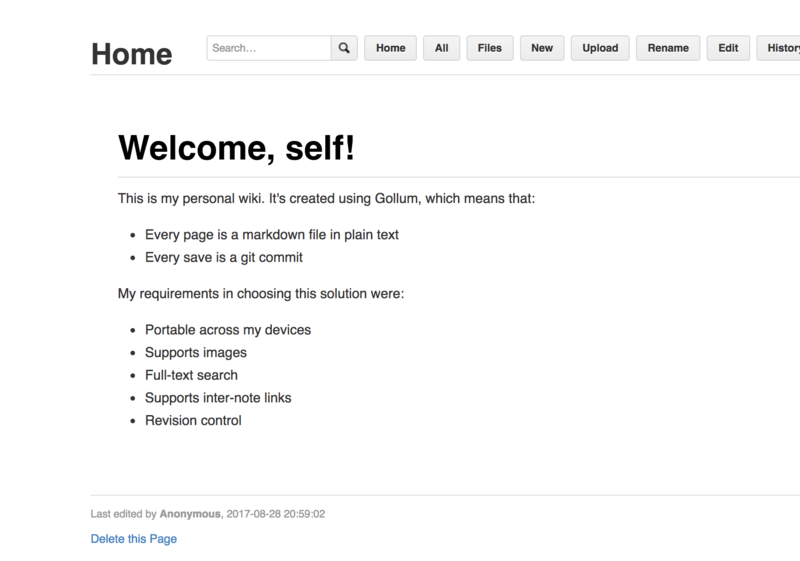 In the current implementation, Gollum is a "single user" tool only. The contents of the wiki are saved as markdown files under /var/data/gollum, and all the git commits are currently "Anonymous"